Dear EarthTalk: Celebrities and billionaires are shelling out big bucks for cutting edge green-friendly cars like the Tesla Roadster. But what are the rest of us—who live in the budget-constrained real world—to do about buying a new car that does right by the environment? With so many new energy efficient cars in showrooms today, there’s never been a better time to go green with your next car purchase. A few years ago the Toyota Prius was the go-to model for those with an environmental conscience and up to $30,000 to pay for the privilege of getting 35-40 miles per gallon (mpg) in the city and 45-55 on the highway. But today there is such a wide selection of fuel efficient and low-emissions vehicles that even those on a budget can afford to go green. To wit, Honda’s new Insight is the first hybrid gasoline-electric car available new for less than $20,000 (starting at $19,800). With fuel efficiency ratings of 40 miles per gallon (mpg) in the city and 43 on the highway, the Insight surely won’t cost much to operate either. There are plenty of other hybrids to choose from today, too, though most cost at least a few thousand dollars more than equivalent non-hybrid models. Toyota’s Prius, which is only available as a hybrid, still leads the pack as the world’s top selling and most fuel efficient hybrid. Its cost has dropped some, now starting at $22,400, and the “3rd generation” Prius 10 now claims an Environmental Protection Agency (EPA) combined city/highway rating of 50 mpg. This most recent edition even features a whimsical solar panel on the roof to power a ventilation system that keeps the interior of the car cool even on scorching hot days. 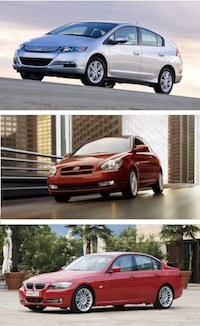 Hybrid versions of Honda’s Civic ($23,800), Nissan’s Altima ($26,780), Ford’s Fusion ($27,625) and Escape SUV ($31,500), Mercury’s Milan ($31,590) and Mariner SUV ($29,995), Toyota’s Camry ($26,150) and Highlander SUV ($34,700) are also in showrooms in dealerships across the U.S. Many smaller cars with regular gasoline engines also get great mileage with low emissions for even less money. Some examples include the Corolla ($15,350), Matrix ($16,550) and Yaris ($12,355) from Toyota, Honda’s Fit ($14,900), the Mazda 3 ($16,045), Chevy’s Aveo ($11,965) and Cobalt ($14,990), the Hyundai’s Accent ($9,970) and Elantra ($14,145), Pontiac’s G3 ($14,335), the Kia Rio ($11,495), the MINI Cooper ($19,500), Ford’s Focus ($15,995), and the Smart Car ForTwo ($11,990). Diesel fuel is now cleaner than ever, and a few automakers are going down that road. Volkswagen’s Jetta TDI ($22,660), Audi’s A3 TDI ($29,950) and BMW’s 335d ($43,900) are three examples of high performance vehicles with solid green credentials regarding fuel efficiency and emissions. An added bonus is that such cars can run on carbon-neutral biodiesel as well as petroleum-based diesel fuel. Consumers just starting their search for a new ride should check out GreenCar.com, which provides detailed information on the many greener vehicles available today as well as those on the horizon. Also, the federal government’s website FuelEconomy.gov provides detailed mileage and emissions information on dozens of new cars every year, and provides users with an easy and free way to compare different vehicles along the lines of environmental impact. CONTACTS: GreenCar.com, www.greencar.com; FuelEconomy.gov, www.fueleconomy.gov. As the lowest link on the marine food chain, plankton—that tiny aquatic plant, animal and bacterial matter floating throughout the world’s oceans—is a vital building block for life on Earth. Besides serving as a primary food source for many fish and whales, plankton plays a crucial role in mitigating global warming. Indeed, the ocean is the world’s largest “carbon sink”: As much as one-third of man-made CO2 emissions are stored in the oceans and therefore do not contribute to global warming. This is because its plant component, phytoplankton (its animal component is called zooplankton), pulls massive amounts of carbon dioxide (CO2) out of the atmosphere as it photosynthesizes. 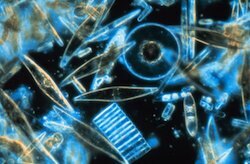 But various environmental factors are taking their toll on plankton the world over. The U.S. National Oceanic and Atmospheric Administration (NOAA) reported recently that marine phytoplankton is declining across the oceans. Even Canadian cod fishermen are noticing that the plankton-feeding fish they catch are often nearly starving as a result of lack of this crucial food source. A 2007 study published in the scientific journal Nature found that human-caused increase in CO2 pollution is altering the pH (acidity) levels in the oceans. This change in chemistry is expected to have adverse effects on the entire ecosystem. More acidic ocean water inhibits the ability of shell-forming marine organisms—from plankton to mollusks to corals—to form properly. Smaller and less healthy populations of plankton would be bad news for all the other creatures above it on the ocean’s food chain. Higher water temperatures, also attributable to our fossil fuel addiction, can also have a devastating effect on plankton. A recent report in the Journal of the Marine Biological Association of the United Kingdom noted that, in the Adriatic Sea cooler winter conditions—which are less frequent in a warmer world—are needed for plankton production and nutrient availability. Furthermore, warmer sea temperatures can cause “blooms” of other sea life (such as happens with algae), resulting in oxygen starvation in the water, a condition that is devastating to plankton and other marine creatures and organisms. In other situations, blooms of phytoplankton themselves—the tiny plants can gorge on the nutrients from the run-off from farms and lawns on land—can lead to oxygen starvation in the water. “The decomposition of these multitudes of phytoplankton removes oxygen from seawater, creating oxygen-poor ‘dead zones’ where fish cannot live,” reports Carly Buchwald, a researcher at Woods Hole Oceanographic Institution. Satellite imagery shows that these “dead zones” are expanding. Some scientists are advocating “iron fertilization”—the spreading of large amounts of iron across the world’s seas—to spur plankton growth. But others worry that such tinkering with complex ecosystems could have potentially harmful effects. CONTACTS: Nature, www.nature.com; Journal of the Marine Biological Association of the United Kingdom, www.journals.cambridge.org/action/displayJournal?jid=mbi; Woods Hole Oceanographic Institution, www.whoi.edu.